Waterperry Gardens has been on my radar for a long time now, but this is my first visit – a perfect break in the drive home from Stoneleigh Park near Coventry and a few hours at the Horticultural Trades Association Plant Show (the best of the plant nurseries from throughout the UK showcasing their wares and in particular, plants new to the market). A short detour from junction 8a of the M40, and I was quite possibly in paradise. Blue skies, fluffy clouds, a light breeze, mellow local stone, formal and wilder gardens, meadow and riverbank, herbaceous planting heading towards its nadir, roses of course and some remarkable trees and shrubs. Made famous by Beatrix Havergal who established her School of Horticulture for Ladies here from 1932 to 1971, it is now home to 8 acres of landscaped ornamental gardens, plant centre and garden shop, gallery and gift barn, museum and teashop and horticulture courses are still run on the site. The next Rare Plant Fair is being held there at the end of the month. 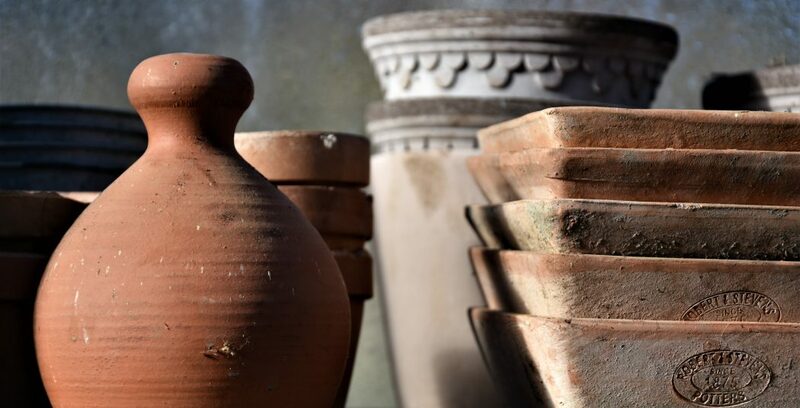 The nursery is well stocked with plants evident in the garden and the gallery has some quite superb ceramics on display. All of the staff I spoke to were friendly and knowledgeable. I’ll break down my photographs into several related posts, covering particular sections of the garden, building up to a rather comprehensive collection of images for these beautiful gardens on a sunny June day. 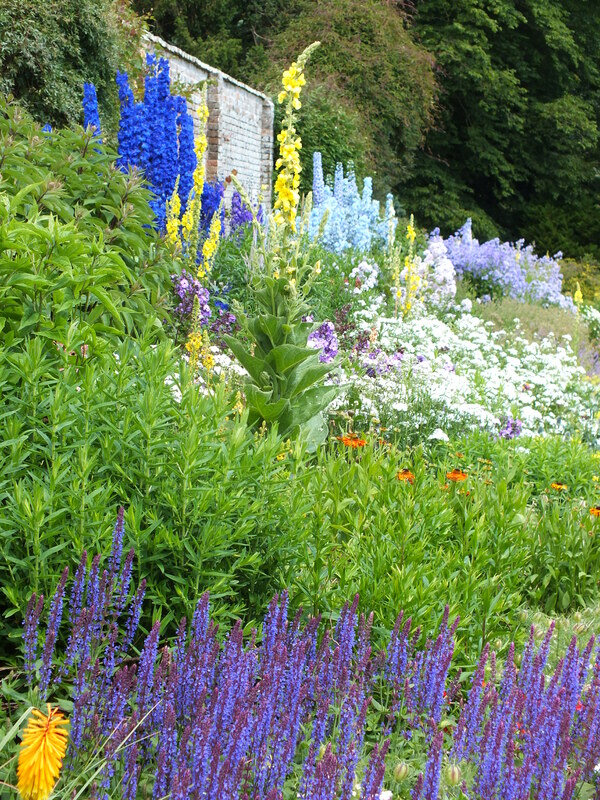 Next time I’m heading up, or down, the M40, I’ll remember these gardens as I suspect the herbaceous planting will continue to look good right through until October – the Spring planting is likely to be rather good too! 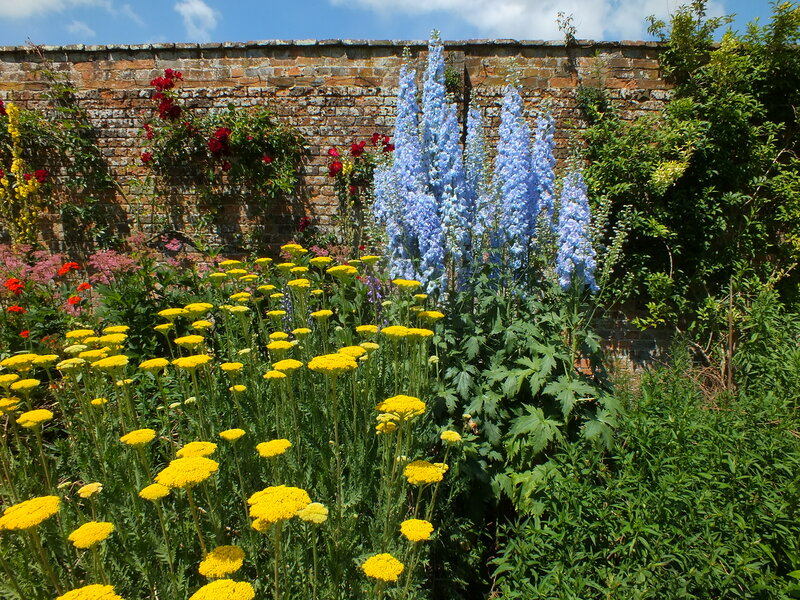 The herbaceous border has been planned to reach its peak on 7th July, Miss Havergal’s Birthday – Delphiniums, Achilleas, Verbascum and Phlox have taken over from Lupins, Anchusa, Geraneums and Veronica which were in flower a little earlier. Asters, Heleniums and solidago will continue the show into late summer and autumn. 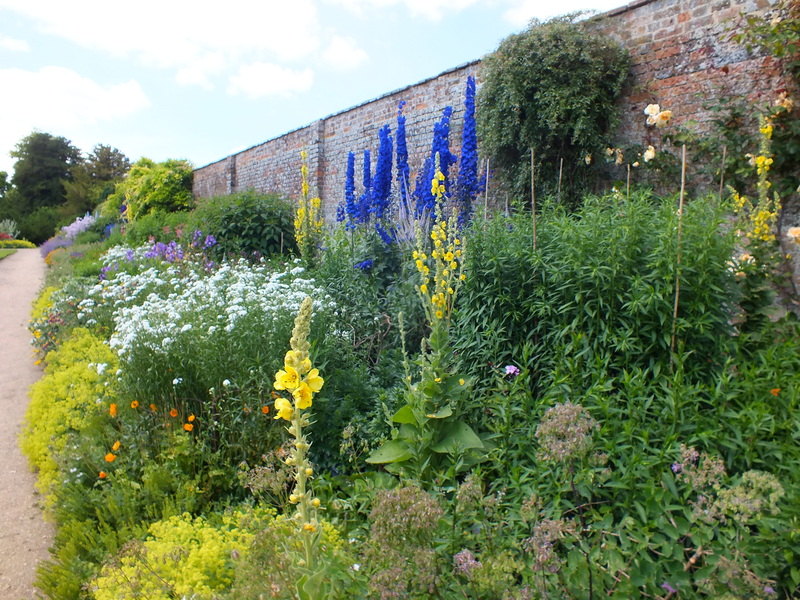 The border is 60m long and backed by the mellow brick of the kitchen garden wall.